Huntsville, AL – Arts Huntsville and the City of Huntsville’s Department of Parks and Recreation’s 2018 Concerts in the Park season returns on Monday, June 4th. 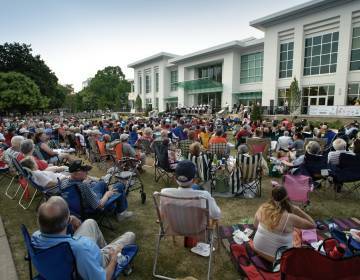 A Huntsville summer tradition, the concerts will be held over ten weeks every Monday evening through August 6th. Monday’s concert features local rock band Howling Strays and groove-band Juice. The series showcases local music talent in a mix of genres from rock, folk, and country to Latin, dance, R&B, and top 40 hits. The Concerts will take place in downtown Huntsville on the Huntsville Museum of Art outdoor stage in Big Spring International Park from 6:30 – 8:00 p.m. The series is FREE to the public; concertgoers should bring their own seating and leashed pets are welcome. Local food trucks and vendors will be onsite, with food trucks along Williams Avenue and additional offerings in the park. The menus include Asian fusion from Pearl Asian Cuisine, New Orleans flavors from Cajun Cravins, BBQ favorites from Badd Newz BBQ, mega-burgers from The Piled High Grill, a variety of shaved ice choices from Iceworks, hand-rolled bagels and pretzels from Canadian Bakin’ Bread, homegrown iced teas from Piper and Leaf, cool treats from Suzy’s Pops, cupcakes from Smallcakes Huntsville, and ice cream from Handel’s Ice Cream. Concerts in the Park is a co-production of the City of Huntsville Department of Parks and Recreation and Arts Huntsville. This year’s concerts are presented with the support of AT&T, Progress Bank, Hexagon PPM, and Topgolf, as well as media partners My Star 99.1, Rocket 95.1 and 98.1 The Beat. For more information on the 2018 Concerts in the Park series and the full season lineup visit www.artshuntsville.org or http://www.huntsvilleal.gov. Arts Huntsville is a non-profit organization founded in 1962 to stimulate and support community creativity and engagement by advancing the arts, entertainment and culture to enrich quality of life, education, and economic development in the greater Huntsville metropolitan region. With nearly 250 member arts organizations, individual artists, arts patrons, and other arts-minded non-profits, companies, and technical and professional organizations, Arts Huntsville focuses on four core program areas while serving as the service organization for area arts groups and individual artists, providing them with resources and tools to ensure their success.